Finding the perfect rollout sugar cookie recipe has been an adventure for this culinary creator. I was SUPER disappointed this past Christmas, when I tried a handful of rollout sugar cookie recipes in an attempt to find the perfect one. I failed miserably. 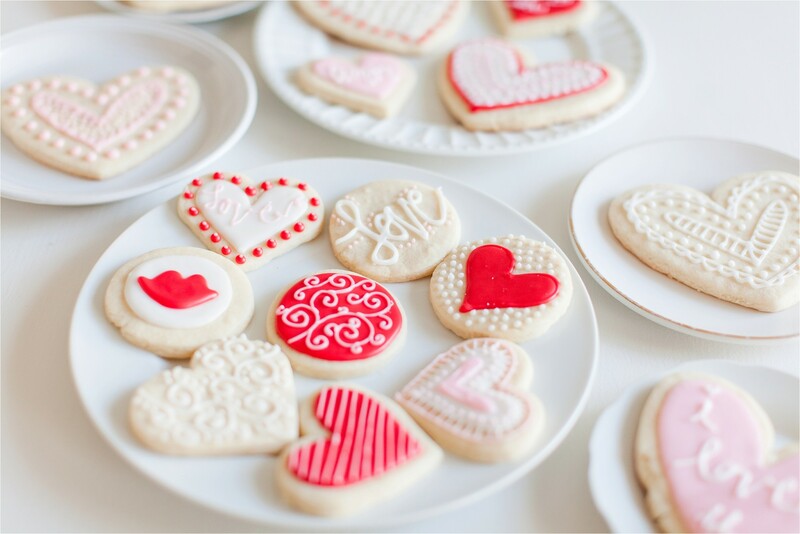 Most required chilling time– and when I wanted to make the cookies, chilling time was the last thing I had time for! Other recipes were faaaaaaaar too “floury” and didn’t have the light and creamy buttery taste that I desired. Then, I found this recipe– and let me tell you: it’s amazing! The key to any sugar cookie recipe is creaming the butter and sugar. Those two things make or break the whole batch! Though this recipe is from the brilliant bakers at Wilton, I’ve included my secret in this post: adding more almond extract. There is something so fragrant and smooth about almond extract. I adore adding it into things to create a different burst of flavor. Vanilla was always my “go to” until I started experimenting with almond. Now that I’ve fallen in love, I can’t go back! 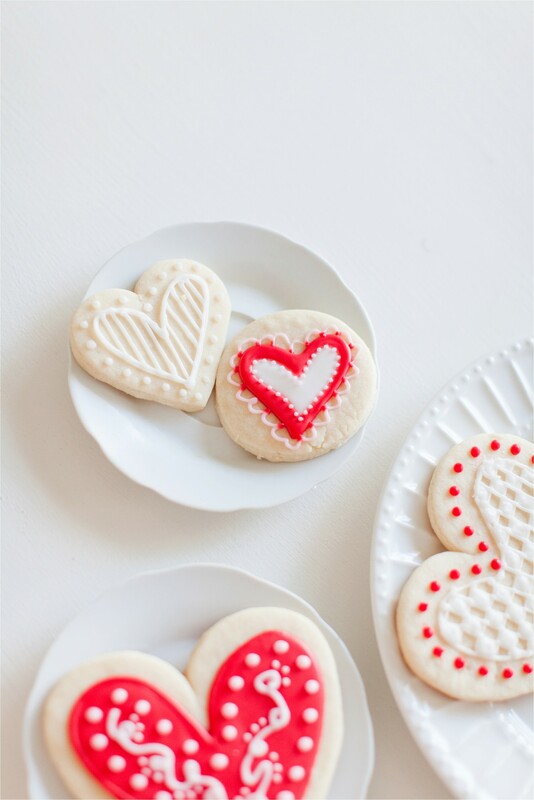 This sugar cookie recipe is super easy and SO yummy. 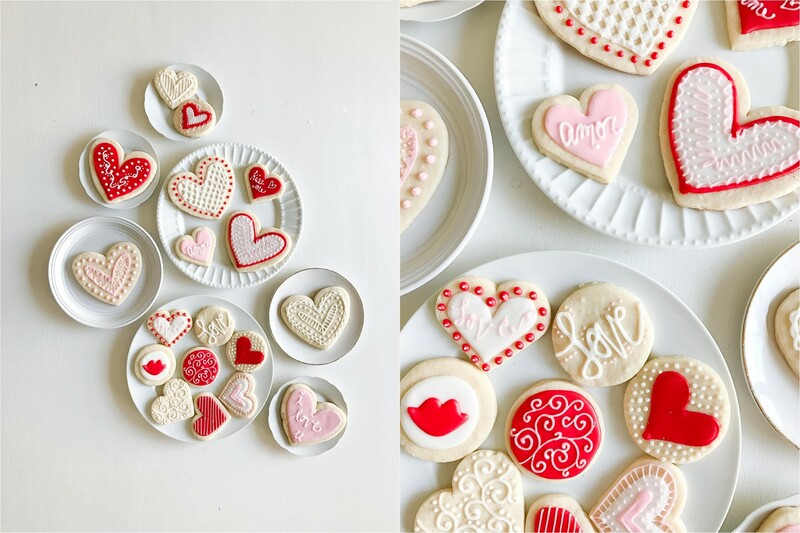 The cookies make the most perfect shapes and they are SO much fun to decorate!!! I’ve included the royal icing recipe below as well!! 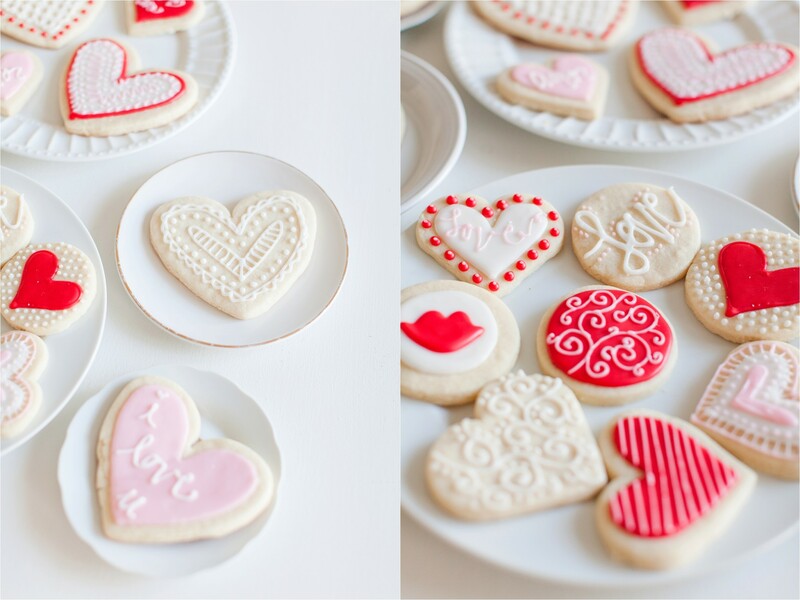 Making these sugar cookies and decorating them for Valentines Day was the sweetest treat! HAPPY VALENTINES DAY!!! In large bowl, beat butter and sugar with a mixer until creamy, light and fluffy. Beat in egg and extract (don’t overmix). Gradually add flour mixture to butter mixture 1 cup at a time, mixing after each addition. On a lightly floured surface ( I put parchment paper down and lightly floured it), roll each ball into a circle approximately 12 in. 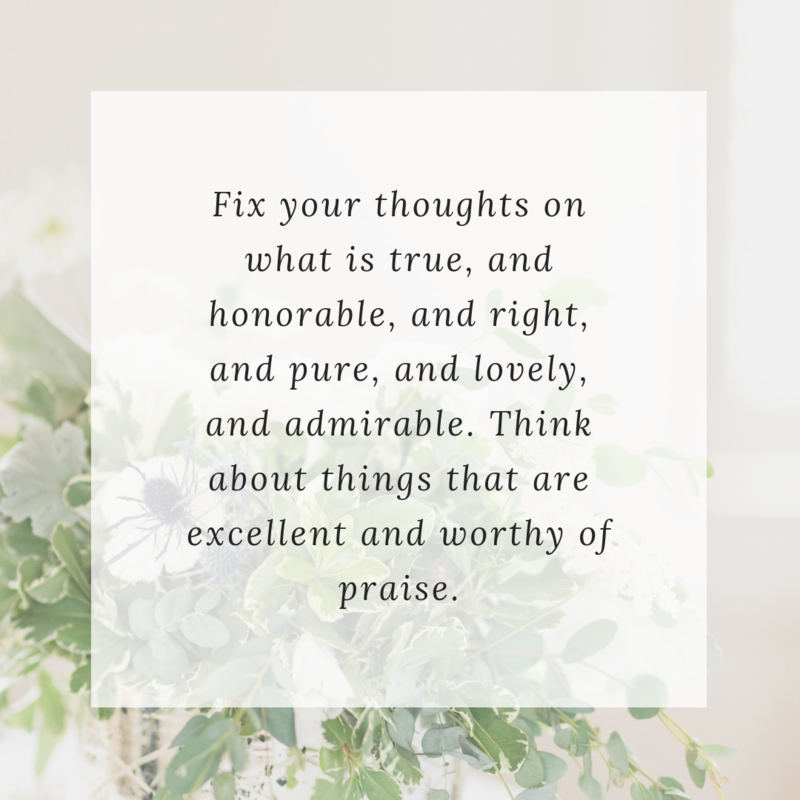 diameter x 1/8 in. thick. 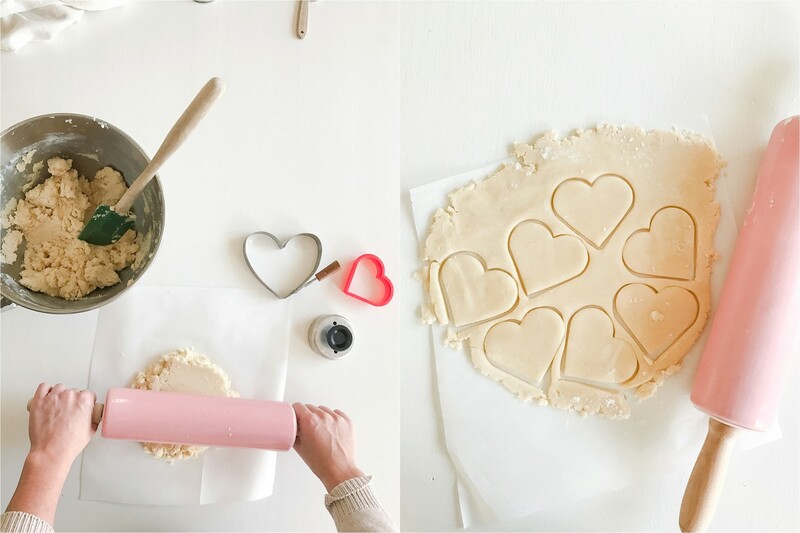 Dip your cookie cutter into flour before each use. Bake cookies on nongreased cookie sheet 8-11 minutes or until cookies are lightly browned. In a small bowl combine powdered sugar, vanilla, and milk. Makes 1/2 cup. Color accordingly with food coloring and have fun!